Power Doppler (PD) has improved diagnostic capabilities of vascular sonography, mainly because it is independent from the angle of insonation. We evaluated this technique in a prospective comparison with conventional imaging, consisting in Duplex and Color Doppler, for the evaluation of Renal Artery (RA) stenosis. Sensitivity, specificity and predictive values of PD and conventional imaging were assessed in a blinded fashion on eighteen patients, 9 with angiographic evidence of unilateral RA stenosis (hypertensive patients) and 9 with angiographically normal arteries (control group). PD images were interpreted with an angiography-like criteria. In the control group both techniques allowed correct visualization of 16 out of the 18 normal arteries (93% specificity). Only in five hypertensive patients RA stenosis was correctly identified with conventional technique (56% sensitivity and 86% negative predictive value); PD was successful in all hypertensive patients (100% sensitivity and negative predictive value), since the operators could obtain in each case of RA stenosis a sharp color signal of the whole vessel with a clear "minus" at the point of narrowing of the lumen. All results were statistically significant (p < 0.01). This study demonstrates that PD is superior to conventional imaging, in terms of sensitivity and specificity, for the diagnosis of RA stenosis, because it allows a clear visualization of the whole stenotic vascular lumen. Especially if it is used in concert with the other sonographic techniques, PD can enable a more accurate imaging of renovascular disease with results that seem comparable to selective angiography. Duplex/CD sonography is used as a routine method for the assessment of RAs [1, 2]. This technique is a reliable diagnostic tool in order to display vascular structures as well as velocity and flow direction of red blood cells by mapping the Doppler frequency shift information. However, the detection of RAs through the anterior abdominal wall with this conventional technique is hampered in a substantial group of patients either by anatomical origin of RAs from a plane that may be almost perpendicular to the ultrasonic beam [3–5], or by several technical issues like bowel gas, breathing movements and obesity. In such cases RAs exploration through modified windows, like the margino-renal, lateral window, is crucial . Furthermore, it is intriguing to complete the sonographic evaluation with PD. PD generates an intravascular color map reflecting the integrated power in the Doppler signal, which essentially depends on the density of red blood cells within the sample volume. Since increased sensitivity to visualize the continuity of blood flow in arterial stenosis is claimed for PD, we evaluated this new technique in a prospective comparison with conventional imaging for the diagnosis of RA stenosis. For the purpose of this study, we considered nine patients (6 men; mean age 62, range 48–76 years) referred from January 2002 to October 2003 for evaluation of hypertension. In particular, these patients had a clinical suspicion of RA stenosis, because of hypertension resistant to the combination of different antihypertensive drugs (beta-blockers, vasodilators and diuretics) associated either with moderate renal failure or with carotid and peripheral atherosclerotic disease. With selective renal angiography, we demonstrated in these patients significant unilateral (5 cases of right, 4 cases of left) RA stenosis; they were considered as the group of hypertensive patients. As a control group, we enrolled nine patients out of the population undergoing left heart catheterization for coronary angiography (5 men; mean age 66; range 55–74 years), matched for age and other risk factors, in whom we demonstrated angiographically normal RAs. All patients gave their written informed consent to participate in the study, that was aimed at comparing the results of conventional technique to those obtained with PD in the identification and characterization of RA stenosis. The sonographic evaluation of RAs of the hypertensive patients had been performed the day before angiography for obvious clinical reasons, whereas controls underwent a blinded evaluation two days after coronary angiography. Such examinations have been carried out by three independent physicians, all having at least a five-year-experience in vascular sonography. Renal sonography is performed in our Department with ATL machines (Advanced Technology Laboratories, Bothell, Washington, USA): "Ultramark 9", "Apogee 800" and "HDI 5000". The last two are equipped with PD facilities and have been used for the present study. For the diagnosis of RA stenosis with the conventional technique, we perform a direct imaging of the main RA, with the color window used to look for the aliasing phenomenon in order to sample the area of the stenosis with PW Doppler interrogation, as widely validated in several previous studies [2, 6]. We consider 200 cm/sec as a diagnostic cutoff for significant RA stenosis. When performing PD examination, we give an estimation of the degree of RA stenosis from the color window itself, considering color as a contrast media and giving an angiography-like interpretation of the images. Furthermore, we use the color window to place the sample volume at the point of the assumed stenosis for a supplemental PW interrogation. The patient undergoing renal sonography is kept recumbent in a lateral position: a left decubitus to explore the right RA and a right decubitus to explore the left RA. A short-axis scanning of the aorta has to be obtained, in order to align as much as possible the ultrasonic beam to the axis of RA, resulting in a low angle of attack. Thus, our purpose is to obtain the highest signal intensity of the RA (Figure 1) using an orthogonal variant of the "banana peel" view . Short axis approach from the lateral window for left RA imaging. The patient is kept in a right decubitus to explore the left RA. A short-axis scanning of the aorta is obtained, in order to align as much as possible the ultrasonic beam to the axis of the left RA. Sensitivity, specificity and predictive values, with 95% CI, of both PD and conventional imaging have been determined on the thirty-six RAs that were examined by using a two-sided Fisher's exact test, with an alpha level of 0,05.
both conventional technique and PD allowed a clear visualization and a sharp spectral analysis of 16 out of the 18 angiographically normal RAs that were studied (93% specificity of both techniques). In two very obese women, the visualization of the left RA was inadequate both with CD and PD: consequently, placement of the PW sample volume and velocity measurement were impossible. For the purpose of the statistical analysis, these two cases were considered as false positives. five cases (4 right, 1 left) of RA stenosis were correctly diagnosed with the conventional technique (56% sensitivity and 86% negative predictive value); in all these cases a PSV higher than 200 cm/s was recorded when the sample volume was placed at the aliasing point of the CD images. In the PD images of these narrowed RAs, color signal clearly contrasted a substantially narrowed vascular lumen in the areas of the ostia; the middle and the distal lumen were normal in all patients, both with CD and PD. Both operators were in agreement that, according to such PD images, the degree of stenosis had to be more than 70%. In the other four cases (1 right, 3 left) of RA stenosis, the conventional sonographic evaluation had failed to clearly demonstrate an obstructive pathology of RAs, both through the anterior abdominal wall and the flank. RAs scanning had been extremely demanding because of suboptimal technical conditions and the diagnosis of RA stenosis had not been possible because direct criteria had not been met; in all patients in whom an almost stable PW interrogation was possible, the PSV was lower than 180 cm/s. The images obtained with PD were similar to those obtained in the former patients, with the color signal clearly in contrast (not only upstream but even downstream) with a significant narrowing of the vascular lumen, thus permitting the operators to advance the diagnosis of RA stenosis. Neither the use of PD color map to place the sample volume for PW interrogation at the site of the stenosis permitted to demonstrate a cutoff PSV, because of the same lack of stability of the PW signal. The degree of stenosis that had been demonstrated with angiography seemed in all cases comparable to that estimated with PD imaging (Figure 2 and 3). Power Doppler image of a stenosis of right RA. This image has been obtained from one of the patients described in the text with the ATL HDI 5000 machine. The arrows indicate the stenosis. The distal lumen of the RA is normal. KID, kidney. A REN DX, right renal artery. V, vein. A, artery. Selective angiography of a stenosis of right RA. 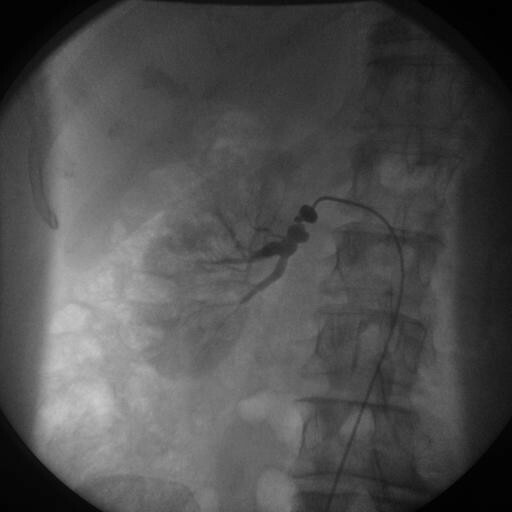 This image has been obtained from the same patient of figure 2 at the time of percutaneous angioplasty. The stenosis of the right RA is evident. Overall data are summarized in the table 1. The four patients that underwent angioplasty with stent implantation had a successful outcome, with almost complete resolution of hypertension and no clinical need for further sonographic evaluations. Overall sensitivity, specificity and predictive values of Power Doppler and conventional imaging. RA stenosis is a common cause of secondary hypertension and angiography is considered to be the gold standard for the morphologic visualization of RA stenosis [7, 8]. Yet, angiography is costly, invasive, and associated with inherent morbidity. Therefore, it cannot be used as a screening method and it must be reserved for the confirmation of a diagnosis suggested by other techniques and for interventional procedures. 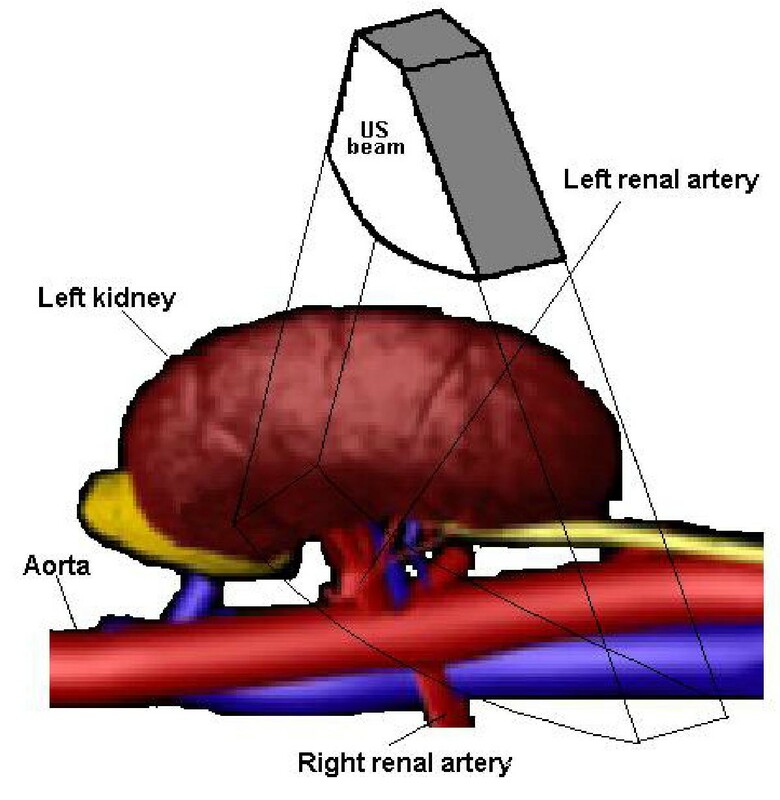 Either computed tomographic or magnetic resonance angiography and captopril renography can evaluate the renal perfusion and the haemodynamic significance of a stenosis [1, 9, 10]. All these techniques are safer alternatives to angiography; nevertheless, scintigraphy does not provide any anatomical information and, moreover, high cost and not widespread availability of all of them may somehow preclude a routine use in clinical practice . Sonography, as a combination of grey-scale B-mode, CD and PW spectral Doppler, is a totally non-invasive technique that is widely used as a first-line examination to advance the diagnosis of RA stenosis [1, 2, 6]. 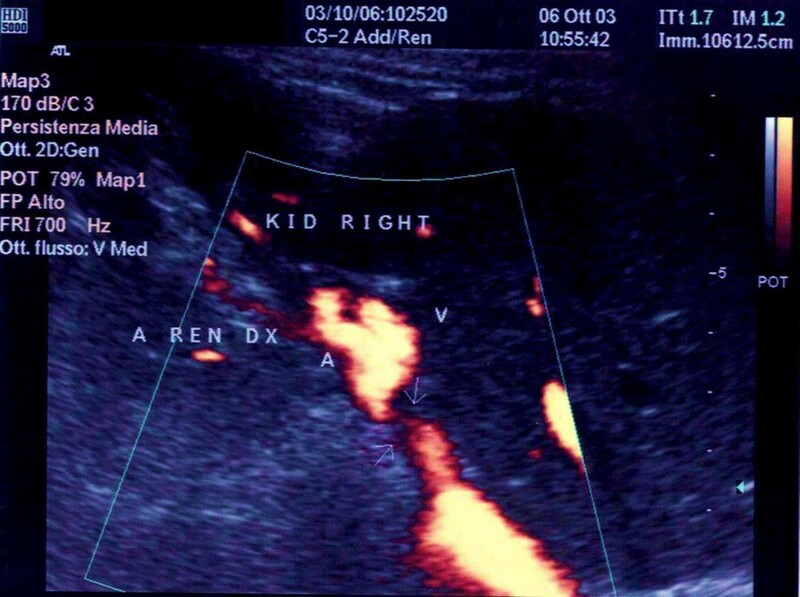 Yet, conventional sonography often requires a high degree of technical expertise in order to provide accurate results. In other words, it may be technically very demanding and time consuming to clearly identify and interrogate RAs because of their angle of origin from the aorta and their sinuous course; further issues arise from anatomical variants, that can result in false negatives, and from technically inadequate test conditions such as body habitus, inability to hold the breath, bowel gas. As an alternative and indirect method of identifying RA stenosis, many groups use to analyze intrarenal waveforms, as pointed out by the original observations by Handa  and Stavros , looking for the tardus-parvus effect. Good results can be obtained only with some quantitative parameters [12–14], whose value in clinical practice has been reviewed elsewhere . Although such "indirect" parameters can overcome technical demands inherent to main RAs interrogation, many groups -as we do- consider them less reliable than "direct" ones [15–18]. Indeed, intrarenal PW examination may be relatively easy in patients without abnormalities, as our control group. To obtain diagnostic-quality spectral signals when the clinical suspicion is high, however, is almost as challenging and time consuming as to obtain satisfactory images of the main RAs with CD and PW interrogation. Moreover, the tardus-parvus technique is limited by a low sensitivity due to the intrinsic variability of Doppler waveforms in patients without abnormalities [16–18] and by the fact that the degree of stenosis necessary to consistently cause downstream flow changes is still unknown: the simple look at the waveform shape and the observation of the presence or absence of an end-systolic peak may only allow to differentiate normal from generically abnormal flow [1, 2]. The development of PD has been permitting further diagnostic possibilities for renal sonography [19, 20]. CD and PD have distinct applications: the knowledge of advantages and limitations of each is essential for their proper application. Both CD and PD elaborate the Doppler frequency shift. The main difference consists in the parameters of the signal that are processed: CD mode processes the mean frequency shift to provide color intensity representing velocity, and the phase shift to indicate flow direction. PD mode generates an intravascular color map reflecting the integrated power in the Doppler signal . Such a parameter depends on the amount of red blood cells producing the Doppler frequency shift, regardless of their flow velocity and direction. Providing a representation of a different property of blood flow, PD has several advantages over CD; it has greater sensitivity to detect the blood flow itself and, with the same angle of insonation, PD images permit better definition of the intravascular surfaces and visualization of continuity of flow than CD ones. In other words, PD images are independent from the angle of insonation . This is particularly useful in arterial stenosis, since PD imaging results in an angiography-like visualization of the whole vascular lumen [22, 23]. Indeed, PD permits to clearly represent in color the low-velocity post-stenotic flow. This could be even possible with broad band CD flow, keeping PRF as low as possible; with such a modification of PRF, yet, the aliasing phenomenon would lose its significance and the frame rate would be extremely low. Moreover, PD improves the visibility of vessels that are sinuous or kinked or lying on a plane perpendicular to the ultrasonic beam, due to its independence from the angle of insonation. Yet, PD disadvantages mainly consist in long scanning time that makes PD images susceptible to soft-tissue flash artifacts and movement artifacts; moreover, PD does not yield directional or velocity information and, consequently, does not permit to detect aliasing, although it gives the operator the possibility to place the PW sample volume at the most stenotic tract of the vessel. Finally, the frame rate is much lower with PD than with CD, so that arteries are not distinguished from veins on the basis of their color pulsatility. Accordingly, PD is a useful tool, but it is complementary to Duplex/CD in vascular sonography: they should be used together for optimal diagnostic results, CD and aliasing being the guides to PD activation. Although there are no universally accepted criteria to make a diagnosis of RA stenosis with PD, displayed perfusion characteristics are similar to those obtained from angiography (Figure 2 and 3). According to our observations, therefore, if an intriguing, angiography-like, interpretation of PD images is given, even of a single frame with a color "minus", this technique is likely to permit an estimation, though not as exact as with angiography [20, 24], of the degree of stenosis, thus of the haemodynamic significance of a plaque. Furthermore, with the appropriate learning curve, PD could shorten the overall imaging time when the angiography-like diagnosis of stenosis is obtained, mainly because it would be not necessary to perform long scans in deep inspiration in order to achieve a stable PW flow trace. In our experience, the evaluation through the lateral window seems particularly useful in the case of left RA stenosis: this is due, in part, to the absence of the good sonographic window created by the liver for right RA. Radiological studies have showed that the left RA has in most cases a lateral origin from the aorta [3–5]: thus the lateral approach, with the patient recumbent on the right side, allows the operator to avoid usual abdominal obstacles and makes the ultrasonic beam aligned as much as possible to the axis of the vessel: the result is the highest intensity of the left RA Doppler signal. The main limitation of this study is the small number of patients the we could enroll, due to the low prevalence of RA stenosis in the whole population of patients with hypertension. Moreover, the overall high specificity (93%) of sonography is not surprising and is consistent with the literature . In our hypertensive patients there was a relevant clinical suspicion of RA stenosis, quite apart from the subsequent angiographic demonstration: this circumstance represents a relevant bias in the selection of patients to be investigated, as to let us obtain high sensitivity and negative predictive values, especially with PD (table 1). Therefore, a larger prospective study is needed, in order to compare PD-guided sonography with conventional sonography for the diagnosis of RA stenosis in an unselected cohort of patients with hypertension. This study demonstrates that PD is superior to conventional imaging, in terms of sensitivity and specificity, for the diagnosis of RA stenosis, because it allows a clear visualization of the whole stenotic vascular lumen. Due to its intrinsic limitations, PD cannot replace conventional sonographic techniques and especially CD, whose aliasing phenomenon is the most useful guide to activate PD during the examination. When PD is used as an adjunctive tool in vascular sonography, it enables a more accurate imaging of renovascular disease with results that seem comparable to selective angiography. AM and GA designed the study, AM, DG and AS carried out the sonographic evaluations, AC and GA performed the angiographic examinations. GA performed literature research and prepared, edited and reviewed the manuscript. FC and DG participated in the design and coordination of the study, and AM, GA, AC and AS are guarantors of its integrity.